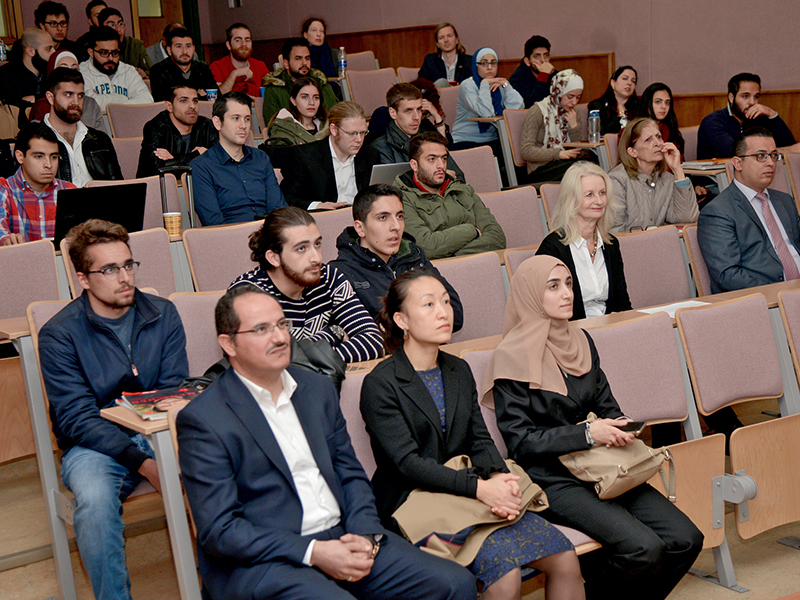 On Monday, December 3, 2018, the School of Applied Technical Sciences (SATS) at the German Jordanian University (GJU) organized the third Scientific Day, under the frame of the German Academic Exchange Service (DAAD) funded project “Inertial focusing on continuous nanoparticles separation in femtosecond laser 3D micromachined curved channels”. Prof. Ala’aldeen Al-Halhouli from SATS welcomed the students, guests, and speakers. He expressed his deep gratitude for the DAAD continuous support to GJU, mentioning the importance of the DAAD programs, which have a dominant impact on developing experiences, exchanging of knowledge and contributing effectively to the society. During the opening, the DAAD director in Amman, Ms. Gabriele von Fircks introduced the DAAD programs. She encouraged students, and faculty members to participate in such programs. After that, Professors and researchers from TU Braunschweig - Germany, University of East Anglia- UK and Jordan University of Science and Technology- Jordan presented their recent projects in the field of microfluidics and its applications, Pharmaceutical innovation and single cell analysis. In the afternoon session of the research day, GJU president, Prof. Manar Fayyad, and vice president, Prof. Dorit Schumann joined the Networking and demo presentations in the Nanolab. She stressed the importance of applied research especially when it can be reflected in a successful collaboration with industrial partners to make products. The Nanolab team presented their recent research projects and discussed possible collaborations among partners.